Paynter, whose near-death experience last year when he was stricken by colitis and a bout of laminitis following his victory in the Haskell Invitational was voted the National Thoroughbred Racing Association's 2012 “Moment of the Year,” returned to the races with a resounding victory at Betfair Hollywood Park on Friday afternoon. 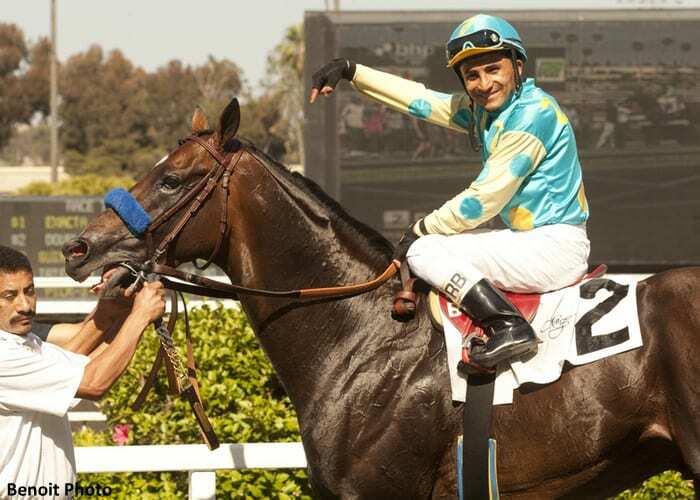 Ridden by Rafael Bejarano, Zayat Stables' 4-year-old colt by Awesome Again was hustled to the front of the seven-furlong allowance race, put away a pesky Majestic City at the top of the stretch, then drew away to win easily. The Bob Baffert trainee covered the distance on the synthetic surface in 1:21.86 after setting fractions of :22.68, :45.67 and 1:09.56. Paynter was the 2-5 favorite. Majestic City held second, with Fly Lexis Fly third. To many it's a miracle that Paynter survived the serious illness that struck him in August, let alone made it back to the races. After being in grave condition, his health steadily improved and he was returned to Baffert's stable in December. The Hall of Fame conditioner brought Paynter back slowly, giving him his first recorded work in February, and gradually getting him back to racing fitness. His courageous recovery made Paynter a fan favorite and the #poweruppaynter hashtag created by owner Ahmed Zayat became a rallying cry for the colt on Twitter. Zayat was ecstatic to see the striking bay back in action. The victory was Paynter's fourth from seven starts. In addition to winning the Grade 1 Haskell he finished second in the Belmont Stakes, beaten a neck by Union Rags, and second in the Derby Trial. This entry was posted in Racing and tagged ahmed zayat, awesome again, Bob Baffert, haskell invitational, paynter, zayat stables by Paulick Report Staff. Bookmark the permalink.